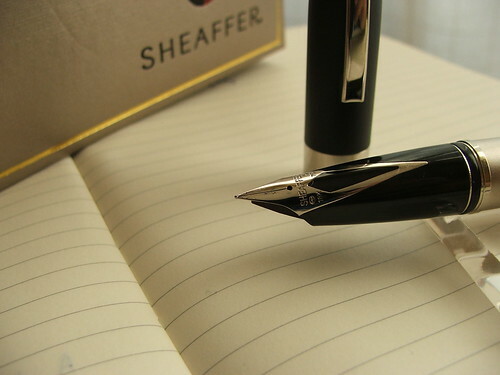 The Parker 61 – released in 1956 – is a follow-on from the phenomenally successful Parker 51. It is less curvaceous than the earlier 51s, there is an arrow inlaid into the hood above the nib, and it has a capillary filler. I have an early version double jewelled model in Burgundy with a 12k rolled gold cap marked Made in England. The medium nib has a slight stub to it (which gives the letters a very soft italic quality) and just enough tooth to scratch pleasantly without feeling rough. 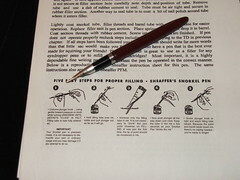 Unlike the Sheaffer Snorkel this has the simplest of filling mechanisms. A plastic tube filled with tightly wound plastic sheets. To fill; unscrew the barrel and dip the filler unit into the ink bottle. Capillary action draws ink into the pen. After a few seconds take the pen out. The tube is teflon coated so the ink just runs off without needing to be wiped. Screw the barrel back on and it’s ready to write. The very first versions of these pens filled by dipping the nib side into the ink, so adverts of the time show pictures of the pen nib down in a Quink bottle with celebrities of the day looking on. 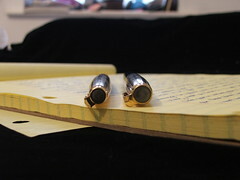 Of course, times had changed since the advent of the ballpoint. The capillary filler is dependable if cared for. 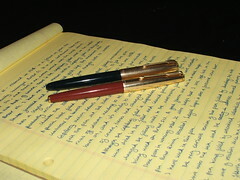 If left unattended, though, ink dries up in the filler and affects the pen’s performance. After a few years of seeing returns in their service department, Parker replaced the capillary filler with the rubber sac. Keep the pen filled with ink, flush the filler with water once in a while, and it works just fine. 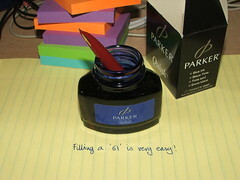 It helps to use safe inks – Parker Quink or Noodlers Legal Lapis are favourite choices of mine. Without the rubber sac, there isn’t the air pocket that reacts to changes in pressure during air travel which causes leaks in fountain pens. I’ve taken this pen onto planes without any trouble so far. 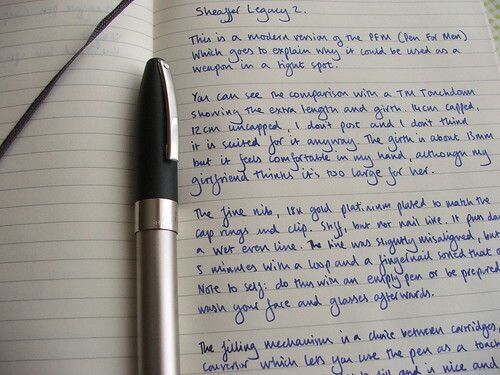 The years following the Second World War, saw the end of the age of the fountain pen. Ballpoint pens were becoming more popular – they were modern and didn’t need the whole hassle of filling. This spurred the major pen makers of the day to come up with innovative filling methods to compete. The Snorkel filling mechanism was one of the last of these new methods. 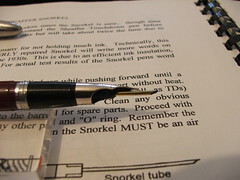 The snorkel in these pens is the small retractable tube below the nib that is dipped into the ink for filling. This means that the nib itself stays out of the ink and you don’t need to clean up after filling. Apart from the tube, the basic filling mechanism is the touchdown. This is a simple pneumatic mechanism. Inside the barrel, the ink is stored in a rubber tube (called a sac). Around this was another tube. When retracted and pushed back in, this caused the pressure in the barrel to increase and collapse the sac. At the bottom of the stroke, the pressure equalises, and the sac expands, pulling ink into the pen. Filling the pen is simple, twist the screw cap at the end of the barrel to extend the snorkel tube, and then pull out the plunger. Put the point of the tube into the ink and then depress the plunger. This expels air and ink from the sac, which then fills up with ink. 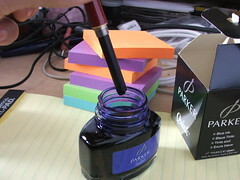 After a few seconds take the pen out of the ink and screw the cap back down, which will retract the snorkel. Because only the tube has been in the ink, and is now retracted, there is nothing to clean up. My particular model is a Clipper. the cap isn’t chrome, but polished stainless steel, and the body is burgundy. The Triumph nib is Palladium-Silver. The medium nib is very stiff but very smooth, and like the Parker 51, the large and enclosed collector makes for a very even ink flow. The stiff nib is also useful when people want to borrow my pen – it is unlikely to be damaged by hands more used to writing with ballpoints. The snorkel is pleasant to use. The long and narrow shape fits easily in the hand and the smooth nib and ink flow make it easy to use. But, when it comes to a choice between the Parker 51 and the snorkel, I’m afraid I have to go with the 51. 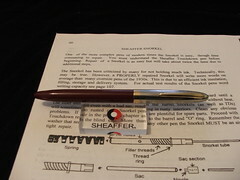 This is a modern version of the Sheaffer PFM (Pen For Men) which goes some way to explain why this could be used as a club in a tight spot. 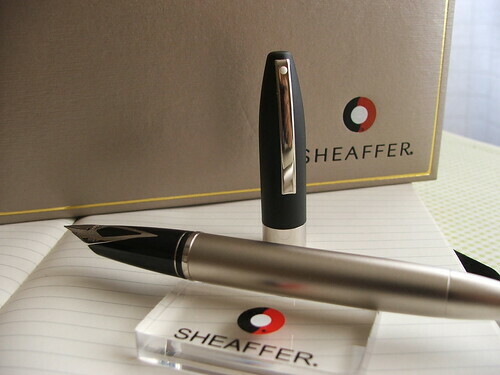 I’ve only recently been turned on to Sheaffer pens. 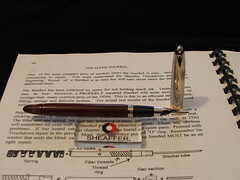 Last year I only had a Sheaffer School pen. Now I have 4 and this is my newest acquisition. 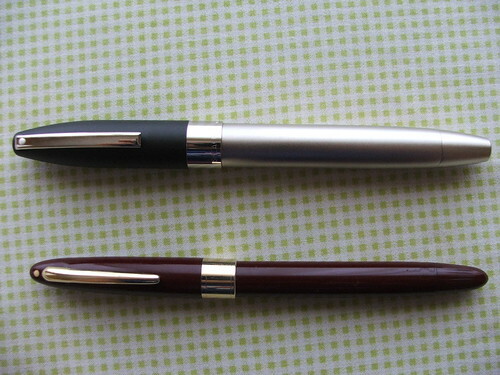 A two colour pen. The cap is matt black, and the body is brushed platinum plate. 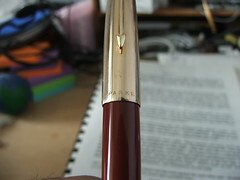 The trim is palladium plated, and the nib is palladium plated 18k gold. The fit and finish is excellent. The cap is a snap on and off, and it requires a good manly action and produces a satisfying ‘click’. Let’s look at this compared with a TM (Thin Model Touchdown), note the extra length and girth. This is not a small pen. 14cm capped, 12 cm uncapped. I don’t post and when I tried to do so for this review the sound of metal on metal just put me off. It’s probably safe to post, but I’m not going to do it. The girth is about 13mm, but I find it a comfortable fit for my hand. This is a hefty pen, but it feels comfortable and in keeping with the size of the pen. I shall see how it feels after a long write out over the weekend. Of course, the real engine of a pen is the nib. This is 18k plated with palladium, and this is a Fine grade. This is a firm nib, but not a nail, there is a little spring to it, and it puts down a wet even line. I was surprised to find the tines slightly misaligned but five minutes with a loupe and a fingernail sorted that out. This was my first time aligning tines, and I’ve learned that it’s best to work on a pen that isn’t filled to avoid washing tiny flecks of ink off one’s face and glasses. The slit is well shaped; a little wider at the breather hole than at the tines, which helps capillary action. The section is smooth and black and the inlay is seamless.The filling mechanism is a choice between cartridges, or a convertor which lets you use the touchdown filler mechanism. Unlike normal touchdowns, this method requires two strokes to fill. You can feel a good airtight seal when you operate the pneumatic tube, and if you open and then tighten the barrel, you can feel the rubber gasket that it screws down onto to make a good seal as well. There is an obvious join at the blind cap, but I think it looks quite attractive – a detail on the plain brushed finish of the pen. 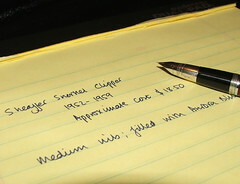 There was no doubt about what to fill this pen with – Waterman Florida Blue. The filling mechanism was painless to use, and the pen started writing straight away. A smooth, but not butter-smooth nib which is good for me because I like a little tooth when I write. And smooth enough to use in a Moleskine without showing through on the other side.I’m pleased with this pen. A modern version of a vintage classic with an interesting filling mechanism and eye-catching nib. Weighty, but not uncomfortable to write with and nicely balanced in use. A pen I would like to leave as a legacy.